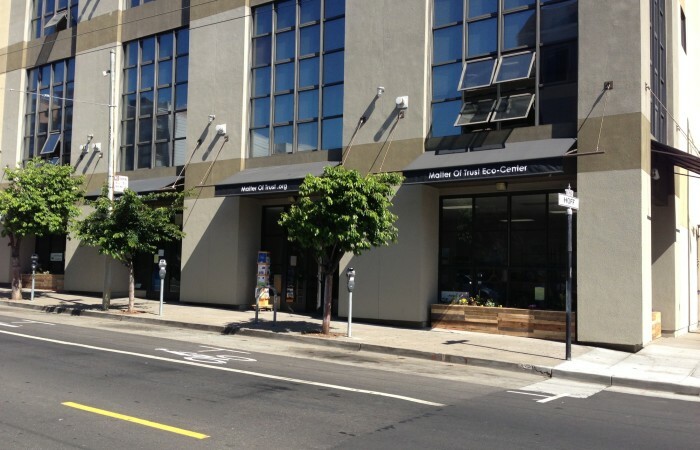 Matter of Trust is proud to have had an Eco-Center in San Francisco! Located in the vibrant Mission District neighborhood with a mix of cultures, long-time San Francisco established and new trendy shops and restaurants as well as homes and apartments. The center was open for three years at a leased facility set up as a hub for walk-in visitors, field trips, after-school programs, interns, apprenticeships, lectures, and so on. In 2016, we purchased two new buildings for our new Matter of Trust Eco-Living Center and Matter of Trust Eco-Industrial Hub. Our original Eco-Center in the mission helped us develop features for our new sites, including permanent and rotating exhibits about our programs, reference materials, and referral library. The mission district center’s eco-educational programs and exhibits concentrated on recycling and renewable resources. We also had a gift shop for green and SF-made merchandise to help support the center. Our store’s philosophy was an extension of the charity’s mission, and proceeds went back into supporting our public charity’s programs. Our new Eco-Living Center and Eco-Industrial Hub will assimilate all of these features and add new ones, creating an access point where youth and families learn and teach about this eco-industrial revolutionary period we’re living in and become part of the solution. Our Expert’s Workbench was a living exhibit where peer-acknowledged, excellent, and charismatic stars of low-tech and hi-tech hands-on sectors come in and chat with visitors while they work on transportable projects.